This is a recipe idea I found from My Fridge Food, and I thought I would use the idea and combine it with my crock pot chicken that I shared with you earlier. 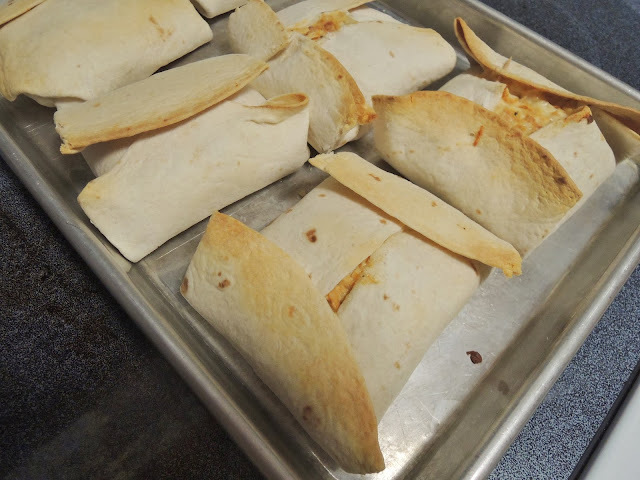 Basically, you combine cheese, cream cheese, and meat and bake it in a flour tortilla. Again, this is a super simple recipe, and the results are delicious!! It's the perfect combination of creamy and crunchy, with a little sweet and a little heat. If you find that some of your tortillas are overstuffed, use a toothpick to hold them together. Try it this weekend! :) Happy Friday! !